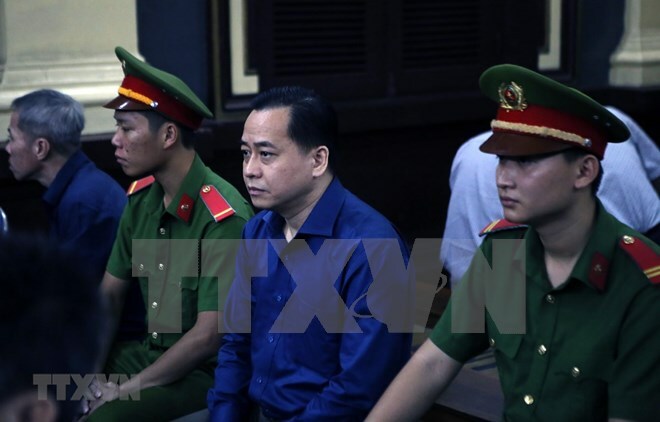 Hanoi (VNA) – Five more people were prosecuted on March 17 and 18 for suspected violations of regulations on the management and use of public capital causing losses and wastefulness and violations of regulations on land management as police have expanded the investigation into Phan Van Anh Vu-related case. The Investigation Police Agency under the Ministry of Public Security commenced legal proceedings against Nguyen Ngoc Tuan (born in 1958), former Vice Chairman of the People’s Committee of Da Nang city and former Director of the municipal Department of Construction, for charges of “violations of regulations on the management and use of public capital causing losses and wastefulness” and “violations of regulations on land management”, under Articles 219 and 229 of the 2015 Penal Code. Phan Xuan It (born in 1954), former Deputy Chief of the municipal People’s Committee Office; and Le Anh Tuan (born in 1959), Chairman of the Board of Directors of the Da Nang Ship Chandler Corporation; and Phan Minh Cuong (born in 1971), former Director of the I.V.C Limited Company, and General Director of the 79 Construction Joint Stock Company, were prosecuted for “violations of regulations on the management and use of public capital causing losses and wastefulness”, under Article 219 of the 2015 Penal Code. Criminal proceedings were also launched against Nguyen Dinh Thong (born in 1954), former Director of the Da Nang Land Exploitation and Management Company, for the charge of “violations of regulations on land management” in line with Article 229 of the 2015 Penal Code. In addition, all the men were given house search warrants. Nguyen Ngoc Tuan, Phan Xuan It, Le Anh Tuan and Nguyen Dinh Thong were banned from leaving their places of residence. Meanwhile, Phan Minh Cuong was put into temporary detention to serve the investigation. Earlier, on January 30, the People’s Court of Hanoi sentenced Phan Van Anh Vu (also known as Vu Nhom), Chairman of the Board of Directors of the Bac Nam 79 Construction Company and former Chairman of the Nova Bac Nam 79 Company, to 15 years in jail for “abusing position and power while performing duties” under Article 356 of the 2015 Penal Code. Vu, born in 1975, is a former Senior Lieutenant Colonel and deputy head of a division at the General Department V of the Ministry of Public Security (MPS). According to the indictment of the procuracy, while operating the Bac Nam 79 Construction and Nova Bac Nam 79 Companies, Phan Van Anh Vu, under the name of the MPS, asked ministries, sectors, and local administrations to rent land to him as well as transfer to him the right to use land and property on land of public housing and land projects in prime positions in Da Nang city and Ho Chi Minh City, which was not in line with State regulations. He then went on to make them his own properties or those of his relatives, transferred them, or put them under shared ownership with other people to earn illegal profits.